Global kitchen knives were first designed in 1985 by Komin Yamada and are manufactured by Yoshikin, Japan. Their beautiful smooth contours and seamless all stainless steel construction eliminate food and dirt traps providing the ultimate in safety and hygiene. The two most innovative features of Global knives are their edge and the way they are balanced. The majority of the Global knives are sharpened on both sides of the blade, just like Western style knives however, their edges are ground steeply to a point much more so than European knives. This straight edge, which can be seen by the naked eye, results in a dramatically sharper knife which stays sharper longer. To balance their knives, Global uses a hollow handle which is then filled with just the right amount of sand to create the correct balance. 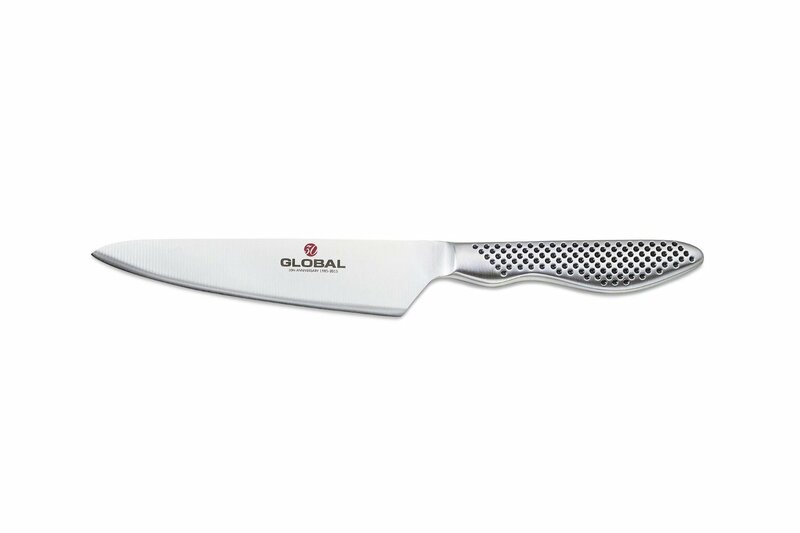 This range starts around £40 and includes the best selling 20cm G2 Global Cook’s Knife a deceptively light and slim bladed knife. Beautifully balanced and practically effortless to use. If you are coming from using a heavier knife, getting used to the weight when using a rocking motion will be a bit awkward at first, but persevere, you’ll find the cutting is more delicate. Even when wet, the handle is safe and non-slip the blade curls back towards the handle making it impossible for your hand to slip forward towards the cutting edge. The cutting edge is superb – tempered, hardened, stainless steel, compared in the adverts to a samurai sword blade. It keeps extraordinarily well. Global recommend that you use a water stone or ceramic whetstone for occasional re-sharpening. Individual knife prices range from £30- £60 and are perfect for peeling, paring and chopping smaller food items. The GF Series is a range of larger, drop forged knives for general preparation. They are more durable for heavy use and favoured by professional chefs. 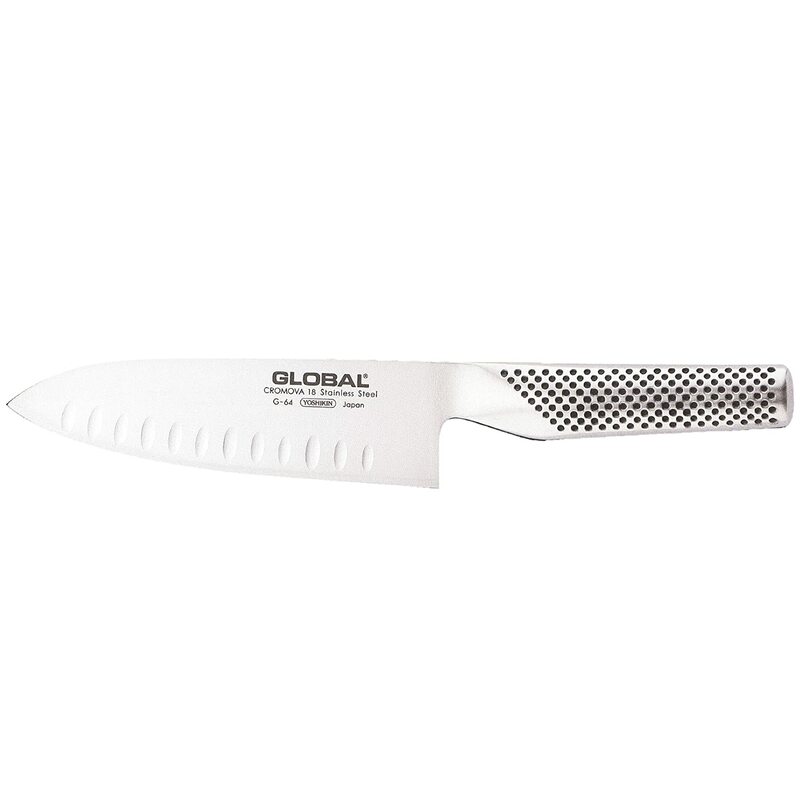 This is reflected the higher costs for these knives for example the Global GF-33 21cm Chef’s Knife costs around £137. 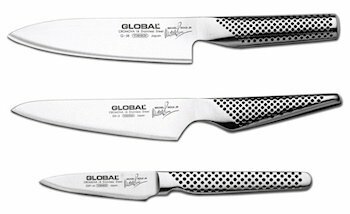 Global knives have partnered with Michel Roux Jr to produce a range of Global Knife Sets. There are a wide range of sets including a 3-piece, a 6-piece and a 9-piece knife set. All the knives and the optional blocks are complete with Michel Roux Jr’s signature and some sets include a free and unique Global & Michel Jr tasting spoon.